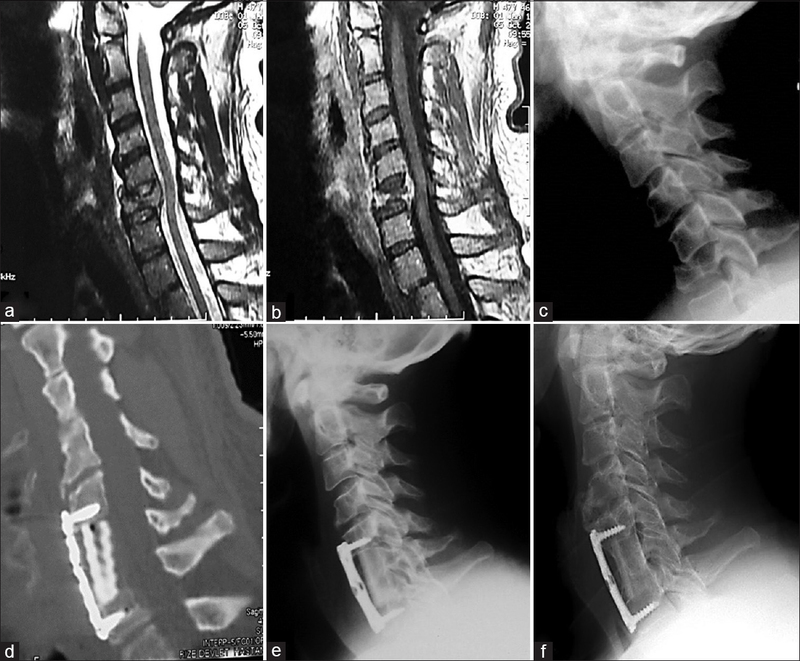 Objective: Anterior cervical arthroplasty (ACA) is the gold standard surgery in severe or unresponsive cases of cervical disc herniation, uncarthrosis, and foraminal stenosis. The aim of this study is to establish the impact and outcome evaluations of managing the patients operated for cervical arthroplasty by the intersomatic porous alumina ceramic cervical cages (PACC). 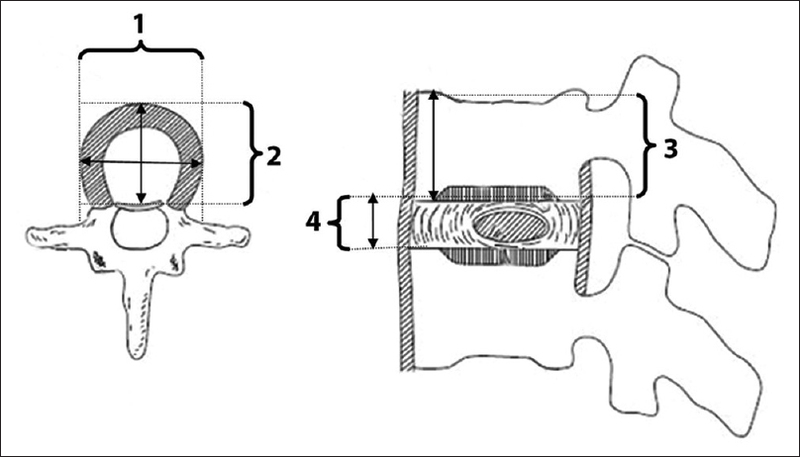 The authors describe their experience in the area to allow the comparison of effectiveness of ceramic cages versus other interbody fusion cages. Materials and Methods: Between April 2015 and September 2018, we operated 118 for ACA by using PACC. Among them, 52 were female and 66 were male, with an average age of 46.78 years. Results: The mean symptoms duration was 14.1 months. The most frequent level of the disorder was C5–C6 followed by C6–C7 level. Mean follow-up was 3.3 years. The Neck Disability Index (NDI) and the visual analog scale (VAS) were used to evaluate the patients status. No significant differences were observed between our results and literature data regarding operative time, duration of hospitalization, and NDI; however, we observed a shorter period and higher rate of bony fusion. Conclusion: The results from the present study corroborate that implementing of PACC is a good alternative treatment for the patient operated by ACA for cervical disc herniation or foraminal cervical stenosis. Introduction: Dysphagia in old patients secondary to diffuse idiopathic skeletal hyperostosis (DISH) syndrome is underdiagnosed. Surgical resection of the offending osteophytes is the definitive treatment. However, the timing of surgery in the course of the disease is still controversial. The study tries to find a correlation if any, between the timing of osteophytectomy surgery aimed to relieve DISH syndrome-induced dysphagia and the surgical outcome. Methods: During the period from 2010 to 2015, clinical and radiological data of patients who presented with dysphagia attributed to DISH syndrome were retrospectively reviewed along with their management and outcome. Results: One female and seven male patients were included in the study. Mean age was 71 years. Mean duration of dysphagia was 3 years and 10 months. 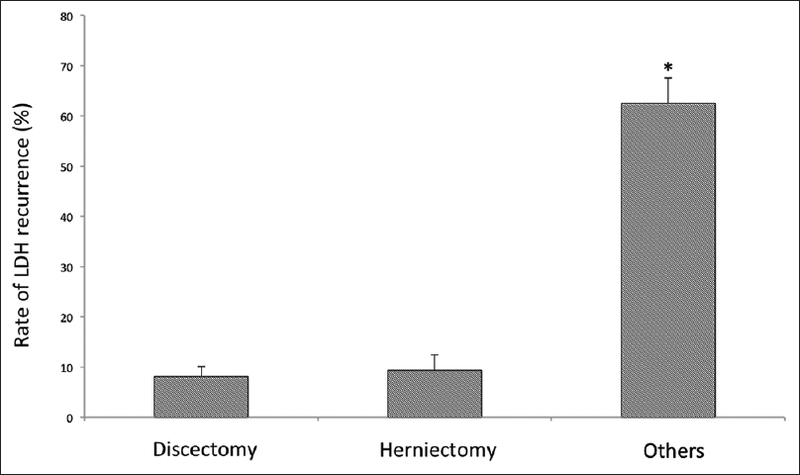 Surgical resection was attempted through anterolateral cervical approach in five cases who were fit for surgery, in which four showed complete resolution of dysphagia (one experienced transient hoarseness of voice for 4 weeks postoperatively), and the fifth showed minimal improvement after limited resection due to intraoperative finding of marked esophageal adherence to osteophytes. The two unfavorable outcomes (subtotal resection and transient hoarseness of voice) occurred in relatively older patients (average: 75.5 years) with longer standing dysphagia (average: 7 years). Conclusion: DISH syndrome as a cause of dysphagia is commonly underlooked. Surgical resection of the offending osteophytes through an anterolateral approach is a safe and effective procedure. For patients who are fit for surgery, older age or longer duration of dysphagia might be associated with less favorable surgical outcome. Purpose: Osteoporotc fractures with posterior wall injury are commonly treated with a pedicle srcrew instrumentation (PSI) or a ballonkyphoplasty (BKP). A predictor for complications for these patients is the American Society of Anesthesiologists (ASA) class. Clinical results in ASA II/III patients who underwent BKP and PSI due to OF were evaluated to find the optimal treatment regimen. Materials and Methods: In a retrospective study design, ASA Class II and III patients with OF type OF 2 and OF 3 according to the German Society of Orthopedics and Trauma Surgery classification who underwent surgery between 2011 and 2016 were enrolled. Perioperative data such as time of surgery, cement leakage, adjacent level fractures, screw loosening, wound infections, and segmental kyphosis correction were measured and a statistical analysis was conducted. Results: Ninety-nine patients met the inclusion criteria, 17 were classified as ASA II and 82 patients were classified as ASA III. Twenty-eight individuals were treated by PSI, whereas 71 underwent BKP. Not only a longer average operation (120 min) and hospital stay (21 days) were documented in the PSI group but also a better kyphosis correction (7.5°). In comparison, the BKP group required an average operation time of 35.5 min with a mean kyphosis correction of 2.1°. A statistical analysis revealed the surgical procedure and not the ASA class to be a relevant factor for complication and revision surgery. Conclusions: BKP is a safe and effective therapy including also fractures with posterior wall defects while PSI showed advantages in restoring the sagittal realignment but higher complication and revision risk. Background: Minimally invasive surgery (MIS) of lumbar disk herniation allows avoiding less of a mess in crossing structures, reducing muscular and cutaneous scarring, postoperative pain, lengthy recovery times, and the rate of infection. The aim of this study is to explain our experience in MIS of disc herniation. We compare the outcome of three different surgical techniques used for the treatment of lumbar disc herniation. Materials and Methods: A total of 1147 patients have been operated from July 2008 to December 2015 for lumbar disk herniation by posterior endoscopic approach. Three hundred and seventy-nine patients underwent discectomy and herniectomy (DH), 557 patients have been operated by herniectomy (H), and 211 patients underwent only bone decompression (BD). Results: The results show 80.10%, 82.06%, and 84.02% excellent outcome, respectively, in BD, DH, and BD techniques. Conclusion: Analysis of the data demonstrates that the results obtained are equivalent and comparable in different used techniques for the treatment of disc herniation, we do not need to perform discectomy in all cases in a systematic way. Objective: The objective of this study is to evaluate the the reliability of magnetic resonance imaging (MRI) in diagnosing alar ligament disruption in patients with potential atlanto-occipital dissociation (AOD). Materials and Methods: Three-blinded readers performed retrospective review on 6 patients with intra-operative confirmed atlanto-occipital dissocation in addition to a comparison cohort of patients with other cervical injuries that did not involve the atlanto-occipital articulation. Ligament integrity was graded from 1 to 3 as described by Krakenes et al. The right and left ligaments were assessed separately. Inter-observer agreement by patient, by group (AOD vs. non-AOD), and intra-observer agreement was calculated using weighted Cohen's kappa. Results: Interobserver agreement of alar ligament grade for individual patients ranged from slight to fair (κ = 0.05–0.30). Interobserver agreement of alar ligament grade for each group (AOD vs. non-AOD) ranged from fair to substantial (κ = 0.37–0.66). No statistically significant difference in categorical analysis of groups (AOD vs. non-AOD) and grade (0–1 vs. 2–3) was observed. Intraobserver agreement of individual patient's alar ligament grade ranged from moderate to substantial (κ = 0.50–0.62). Conclusion: The use of MRI to detect upper cervical ligament injuries in AOD is imperfect. Our results show inconsistent and unsatisfactory interobserver and intraobserver reliability in evaluation of alar ligament injuries. While MRI has immense potential for detection of ligamentous injury at the craniovertebral junction, standardized algorithms for its use and interpretation need to be developed. Purpose: In this study, we would like to describe a novel technique for subfascial insertion of magnetically controlled growing rods using chest drain during surgery for early-onset scoliosis. Materials and Methods: Posterior approach, surgical dissection to the spine is performed exposing the relevant anatomy to allow placement of pedicle screws always in the distal construct and pedicle screws or hooks in the proximal construct. To allow easy passage of the Magnetic Expansion Control (MAGEC) rod, as well as easy maneuvering of the rod in either the cranial to caudal direction, we use a chest drain of size 24 French diameter as a tunnel. This allows surgeons to fit the nonflexible part of MAGEC rod in the middle of the deformity and cut to length passed through the chest drain from a cranial to caudal position and then chest drain is removed. Results: A total of 40 children with early-onset scoliosis had insertion of MAGEC rods using this technique. There were 21 female and 19 male patients. Early-onset scoliosis etiology is idiopathic in 20 patients, neuromuscular in 16 patients, and others in 4 patients. Median age across all groups was 7 years (range 4–13) at the time of surgery. Follow-up ranged from 11 to 56 months with a median of 24 months. Conclusion: The use of a chest drain during subfascial passage of magnetically controlled growing rod is a safe, reliable, reproducible novel technique. This shortens overall time of surgery in our experience. Purpose: Odontoid fracture is a very common cervical injury, especially in elderly patients. Despite the high frequency, the appropriate management is still debated. The aim of this study is to evaluate clinical and radiological outcomes after anterior screw fixation or halo vest (HV) in type II odontoid fracture in elderly patients. Materials and Methods: Between January 2013 and December 2015, 135 consecutive patients affected by odontoid process were found. According to inclusion and exclusion criteria, 57 patients were included in the study. Patients were evaluated with visual analog scale (VAS), Smiley–Webster Scale (SWS), Italian Version of the Neck Disability Index (NDI), and patient satisfaction during follow-up. Furthermore, radiological data were evaluated for bone healing. Student's t-test or Fisher's exact test was used between groups, analyzing radiological and clinical results, and level of statistical significance was set at P < 0.05. Results: Seventeen patients were female and 40 were male. Twenty-seven patients were included in surgical group (SG) while 30 were included in HV group with a mean follow-up of 37.74 ± 10.52 months. A significant difference (P < 0.05) between groups was found for pseudoarthrosis, with a lower rate for SG. No significant differences in term of VAS, NDI, and SWS were found between groups (P > 0.05); SG reached higher satisfaction than HV group (P = 0.0271). Conclusions: Both treatments are equivalent in terms of clinical outcomes, and they are a valuable choice in the management of type II odontoid fracture. However, it must be considered that patients could slightly tolerate HV and may need a change of treatment. The most common cause of spinal tumors is metastases, but the cervical vertebra is the least common region of spinal metastasis, and relatively, little is published about surgery in metastasis to the cervical vertebra. While spinal metastasis is most often caused by neoplasms originating from the lung, breast, and prostate, renal cell carcinoma (RCC) metastasis is very rare. 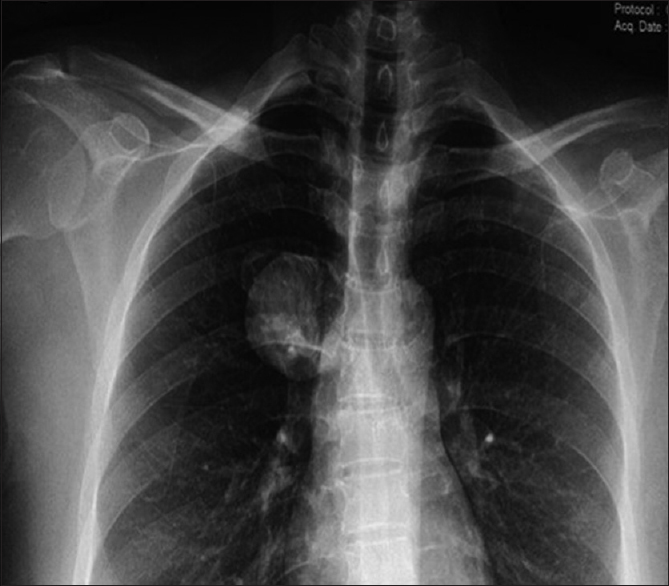 A 47-year-old patient introduced here presented with severe pain spontaneously on his neck and in his arm. In the radiology of the patient without neurological deficit, a pathologic vertebral collapse was detected in the C6 vertebral corpus. The patient underwent anterior cervical corpectomy. The fibula graft taken from his right leg was implanted in the emptied area and supported by an anterior plaque, and restoration of physiological cervical lordosis was established. From the pathological tissue that was taken, it was determined that the cause of the lysis was an RCC metastasis. After surgical repair of the cervical spine, a primary pathology with a diameter of 10 cm was detected in the patient's kidney, and a radical nephrectomy was performed. After 6 years of follow-up, there was no recurrence, and the patient continued his normal daily life. 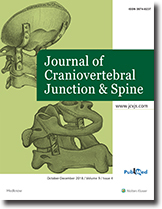 Radiologically between the autologous fibula graft and its own vertebral body was observed to achieve very good fusion. In this study, we emphasized the importance of resection of metastasis together with a primary tumor in a metastatic RCC case to cure the patient and provide the desired quality of life. 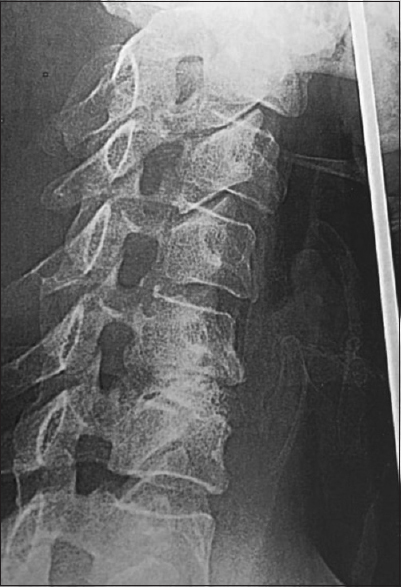 A 40-year-old female presented with back pain without any neurological deficits. Radiological investigations revealed a ventrally situated paraspinal lesion causing widening of the right D4 neural foramen. She underwent a right posterolateral thoracotomy and excision of the lesion in toto, which was reported as a hydatid cyst on histology. Ventrally situated paraspinal extradural hydatid cysts are rare. 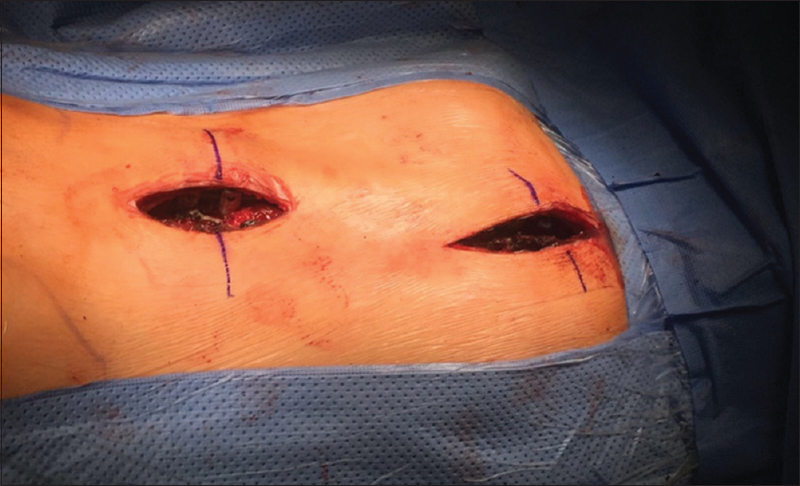 A Transthoracic surgical exposure offers a direct approach for complete excision of the lesion, minimizing the chances of rupture and spillage. 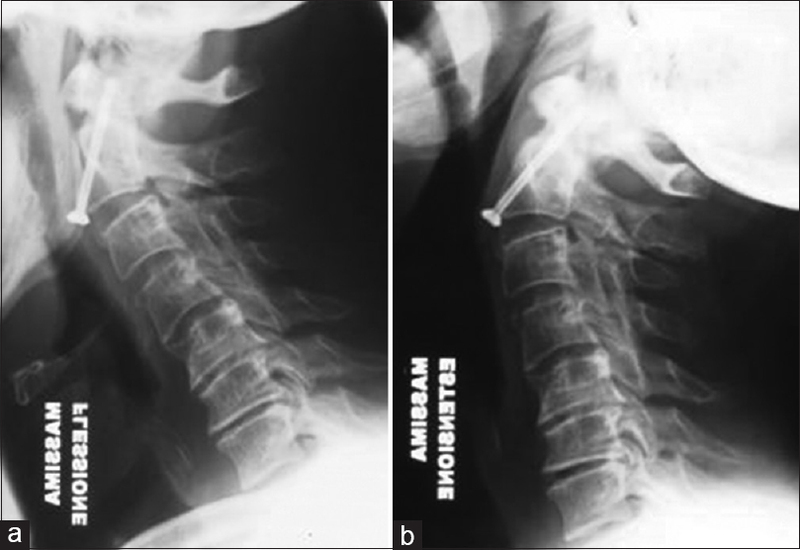 A 56-year-old female patient was admitted with a history of pain during neck movements after cervical injury. Computerized tomography scan revealed type II odontoid fracture and fusion anomaly between C2 and C3 vertebrae. At surgery, the anteroinferior part of C2 vertebra corpus could not be reached; therefore, transodontoid screw was advanced from C3 vertebra toward odontoid process. At follow-up examination, the complaints of the patient had recovered, and fracture line was completely fused. Advancing screw from C3 to odontoid process via anterior cervical approach could be thought an alternative treatment option in the patient with short neck caused from vertebra fusion anomaly and/or obesity. Transoral odontoidectomy followed by occipitocervical fixation is a widely used approach to relieve ventral compressions at the craniovertebral junction. Despite the large amount of literature on this approach and its complications, odontoid process regeneration and causing the worsening of symptoms of brainstem dysfunction and upper cervical cord were not found in the English literature. 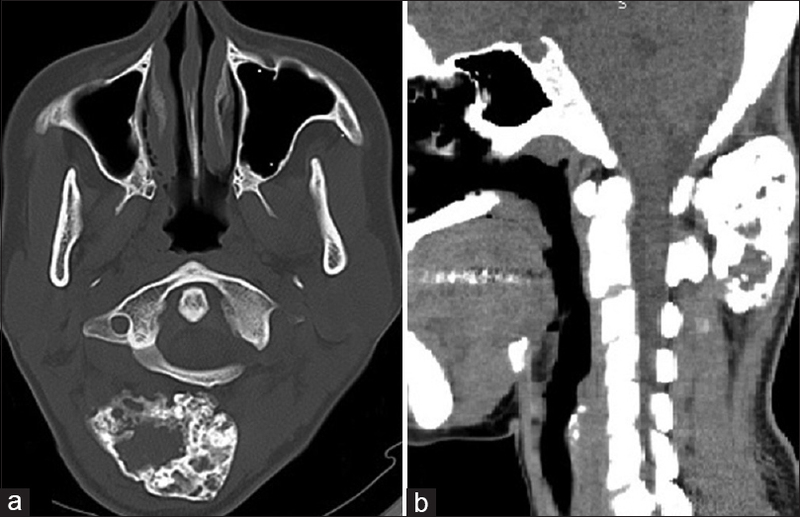 We report the case of odontoid regeneration in a 12-year-old girl. 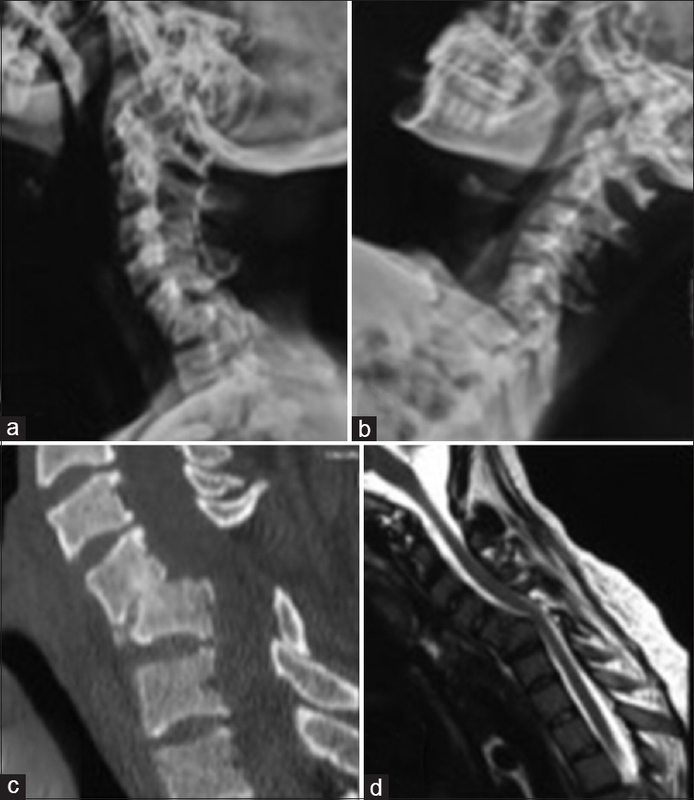 She presented with torticollis and symptoms of brainstem dysfunction and upper cervical cord compression with syringohydromyelia and underwent transoral resection of dens and posterior occipitocervical fusion at the age of 7 years. Post surgery, clinically and radiologically, the resolution was evident till the age of 11 years when the child started to have relapse and worsening of the previous symptoms. The computed tomography/magnetic resonance imaging shows regeneration of the odontoid process compressing the brain stem with an increase in syringohydromyelia. 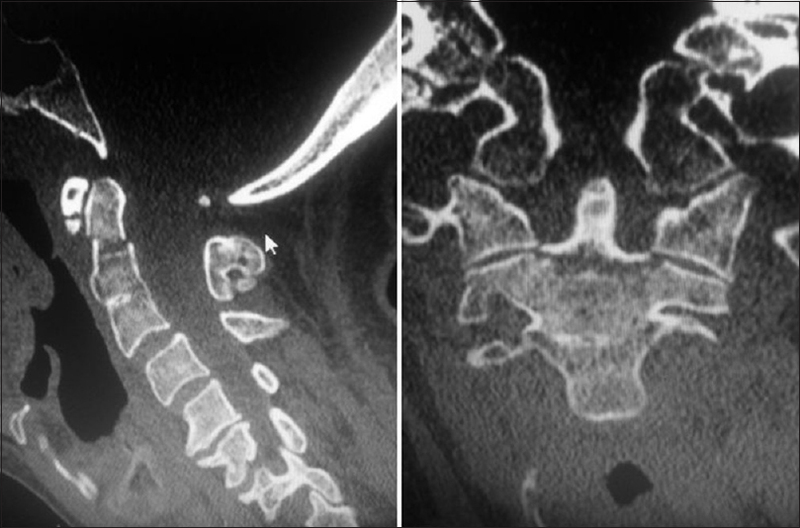 We suggest that there is a need for the removal of the complete odontoid process with periosteum and also beyond the dentocentral synchondrosis to prevent late recurrences of odontoid regeneration. 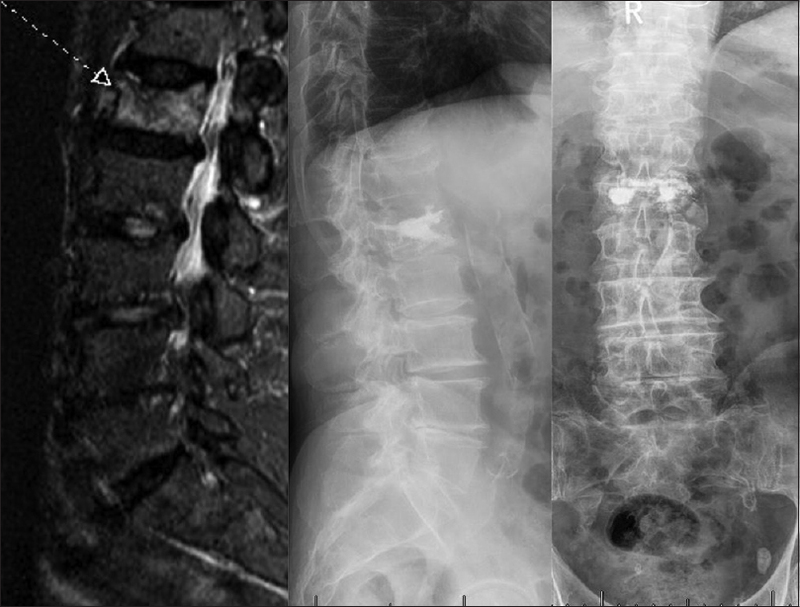 Periosteal enchondromas located in the spine are rare. 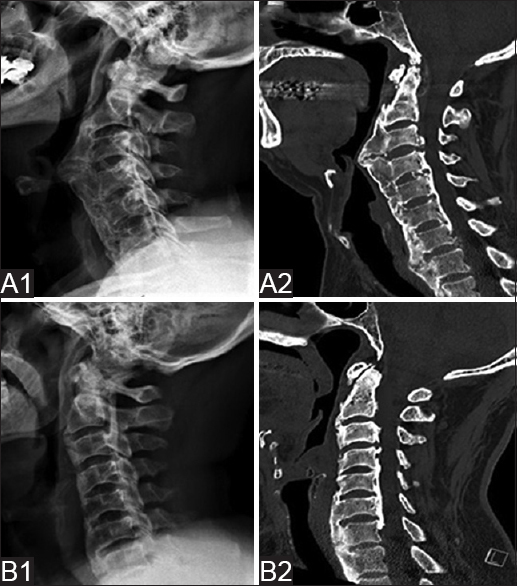 We reported an even more infrequent occurrence of a periosteal enchondroma in the cervical spine of a 19-year-old girl. During the operation, a giant (>8 cm × 5.5 cm × 5 cm) ossified periosteal enchondroma with involvement of posterior structures and muscles of the axis was resected. The pathological examination revealed that the tumor consisted of enchondroid tissue with typical chondrocytes, confirming the diagnosis of periosteal enchondroma. Early identification of the initial lesion should be coupled with total surgical resection, as a definitive treatment, to prevent malignant transformation. Enchondromas grow in an expanding manner which makes easy total resection.